Preheat the oven to 350 degrees F. Line an 8 x 8 or 9 x 9 inch square baking dish with parchment paper and set aside. In a large bowl, whisk together the sugar, flour, cocoa powder, salt, and baking powder. Make a well (hole) in the center and drop in the butter, eggs, and vanilla extract. Mix together thoroughly and then fold in the chocolate chips with a rubber spatula. Spread in one even layer on the bottom of the parchment-lined baking dish. In another large bowl, mix together everything except the chocolate chips until thoroughly combined. Fold in the chocolate chips. Carefully spread on top of the brownie layer in the baking dish. I find it's best to drop clumps in various locations on top of the brownie batter to help get an even spread without mixing the two together. Bake until golden brown on top, about 30 to 35 minutes. Let cool. Holding the parchment paper, lift out of the pan. Cut into squares and enjoy! What kind of peanut butter do you use in this recipe? Do you think homemade peanut butter would work? I’ve had trouble cooking with natural peanut butter in the past and am wondering what you chose. I can’t wait to make this recipe, though, it looks delicious. As always, thank you for the post. Keep ’em coming! I’ve never tried homemade peanut butter in this recipe and actually tested it with the natural jarred stuff since that’s probably what most people have at home. You could always add a little more melted butter if you have trouble stirring up your homemade version with the other stuff. Enjoy! Oooooh these look amazing! Can’t wait to try it and I love that you leave room for treats- even if they have some sugar! Funny, I just came on your site to look for a brownie recipe as my girls are requesting it for Valentine’s Day instead of jam heart cookies. These look great. I’m sure you have not tried it, but do you think I could sub sucanat or coconut sugar for the brown sugar? I do not think I have any brown sugar at home. Thanks! These look delicious! Can’t wait to try them. Chocolate and peanut butter is definitely one of my favorite combos. Can you tell me why the parchment paper? I use it when the recipe calls for it, but how it is different than buttering the pan? Thank you! Lining with parchment paper is so that the brownies are easier to get out. A while back I saw Martha Stewart line a brownie pan with parchment paper. She went up and over each side securing with a metal binder clip. I tried it and now do the same every time. It makes it SO easy to get the brownies out of the pan. Simply tear a piece of parchment large enough to line pan width wise (I usually make a rectangle pan) roll, measure against the bottom and cut. Repeat for length (same for square). Then butter pan, line with parchment, secure with binder clip, butter paper and repeat with second piece. What could I use instead of brown sugar? I have maple syrup, honey and sugar on hand. Hi Becca. Sorry that we are not usually able to answer recipe questions in real time. You could not sub a liquid one to one with a granulated sugar and expect the same results. How would you make these Gluten Free? Is that possible? Try buckwheat flour. I’ve used in place of whole wheat flour in recipes with the same results and not much of a different taste. Still delicious. Thanks. I will. Great idea. These look REALLY good – but do you have any thoughts on a gluten-free substitute for the whole wheat flour? Hi Angela. You could try a gluten free whole grain blend but we’ve not tried subbing the flour in this recipe. I really want to try this recipe. I cannot use wheat, would you recommend another flour besides white? How about Organic Spelt or Almond? Hi Marta. Spelt is a good sub for wheat. I almost always use coconut oil in place of butter with equal results. Thanks for the recipe, these look delicious! I’d love to take a batch to my daughter’s school for valentine’s day but they are tree nut free, do you think sunflower butter would work? You might also try soy nut butter if that’s allowed. It’s very similar in taste to peanut butter. Hi Kristina. I’ve replaced peanut butter in many recipes with Sunbutter and it has worked well. These look like the perfect treat to make over the long weekend! Thank you. These look yummo! What brand of peanut butter do you recommend? Hello Donna. No brand in particular. Just look for an organic pb with peanuts as the only ingredient (a little salt is okay, too). My personal favorite is Costco’s Kirkland brand but there are lots of good ones out there. These look delicious and so easy to make! Going to try them this weekend! I love your recipes, but when I’ve made your other brownie recipe in the past the result has been a little dry. I started subbing in maple syrup (something I started doing thanks to your many delicious muffin recipes), and they come out just right for my family (with the bonus of being refined-sugar free). It just so happened that I had all of these ingredients in my cabinet, so I just finished baking a bath using a gluten free flour mix! These are absolutely delicious!!!! Thanks for sharing this fantastic recipe! LOVE this recipe (as I have all of them – own the cookbook and bought it for relatives)! Quick question: Do you buy organic wheat flour? I buy the King Arthur Whole wheat flour (that I think you’ve mentioned before) but I don’t buy the organic brand. Should I? I do buy organic produce and organic sugar, local honey, hormone free meats etc etc HOwever, grains I’m always unsure what to do. advice appreciated! Hi Cyndi. Another reader suggested buckwheat flour but we have not tried. I made just the brownie layer and I found them to be too cakey. I prefer fudgey brownies. Made these last night….. Fabulous!! I served them with homemade whipped cream. They were a hit with everyone! Thanks, Lisa, for another great recipe! Look absolutely delicious and decadent – perfect any time but especially for Valentine’s Day. Planning to make this afternoon but first need you to please clarify ingredient in brownie layer – is it 1 stick (which is equivalent to 1/2 cup) of butter, melted OR is it 1/2 cup melted butter? Thank you in advance for your response. Do you think you could substitute the peanut butter with sunbutter? Hi Pam. Yes, I think that will work. 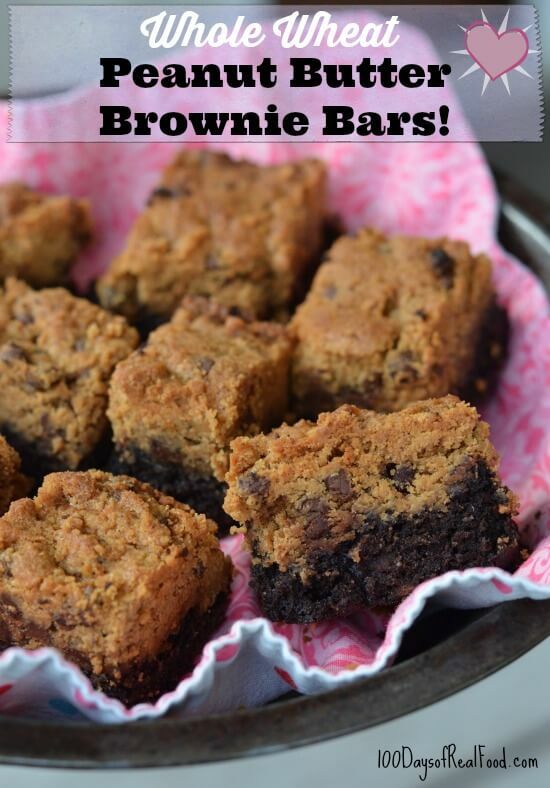 I made these with Almond butter, and they were great! We ate them as a Valentine’s Day treat. Great recipe. I made it gluten free by using buckwheat flour. My son said he could eat 15 pieces. That means it is a great recipe. A wonderful valentine treat and easy to make. I made this in an 8X8 for the family, but would like to bring it to a gathering…I plan on doubling the ingredients and wondered if the baking time would be the same? Thanks, it was very tasty!!! I usually double 8 x 8 recipes into a 13 x 9 pan with great results. I usually cook it for the shortest amount of time and just really watch it. We have a soy and peanut allergy in our family. I can use our soy free choc chips, but have you ever had anyone make with sunflower butter? Made these for Valentine’s Day, and they were a hit. A nice treat! I got the Real Food Cookbook for Christmas, and I have made about 10 recipes between the book an the blog so far – love it! Made these yesterday with homemade peanut butter and they turned out great and they are all gone! Everyone loved them! Thank you! These look delish and easy! Will definitely be making these soon! Aw, I wanted so much to love these but they were not hit with my family. I think the cakey texture and the peanut butter/chocolate combo itself just wasn’t for us. 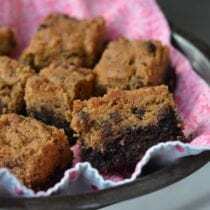 I’ll stick with your 5 Minute Brownies – they are our favorites for sure! These were okay, but for the amount of sugar that this recipe calls for they are not worth it. If you do make them take them out at 30 mins. My family loved these!!!! I did not use the dark cocoa and I even took some to work and they were all gone in minutes!! thank you! Made these today. They were delicious! Thanks for the recipe! I made these tonight and LOVED them. I substituted the sugar for honey and they still tasted great. Looking forward to seeing what my 2 year old thinks, my husband thought they were ok. Which is fine by me….I will enjoy this treat by myself!! Did you have to make any other adjustments to the recipe because you used honey? I like to use honey instead of sugar as well. These are delicious, my family loves them. I modified it a bit using Coconut Palm Sugar in place of the sugar and coconut oil in place of the butter in the brownie layer. OK, these hit the spot! Loved them! 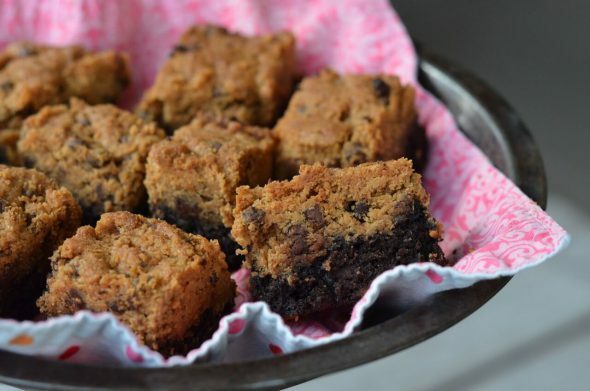 We love these brownies a lot! I was looking to see how many carbs are in a serving size? My dad watches carbs because of diabetes. So I was curious if anyone knew how many carbs per serving these brownies have? Thanks in advance. Hi there. We do not provide nutrition details. This post helps explain the philosophy behind that. We looove these! The last time I made them, I used half melted butter and half melted coconut oil. It worked well so next time I think I will only use coconut oil (and no butter!). I also used half white sugar and half coconut sugar for the brownie part and next time think I’ll cut out the white sugar completely and just use coconut sugar. I’m also thinking about using a chia or flax egg in place of one or more of the eggs. Thanks for this great (and delicious!) recipe! I’m dairy free so I’m glad to hear coconut oil works!! Can I make these with honey or maple syrup and real peanut butter? Hi there. We’ve not tried to make this recipe with honey or maple syrup.